I was half-asleep when my car screeched to a halt on a dusty, rural road in the central Indian state of Madhya Pradesh. My driver nudged me sharply in the ribs – barely 20 metres ahead of us was a flash of orange and black. As I scrabbled in vain for my camera the tigress casually sauntered across the tarmac, pausing briefly to give us the once-over, and then disappeared into the undergrowth. We were well outside Kanha National Park, a Kiplingesque landscape of lush forests, savannah grasslands and meandering streams home to an estimated 40-45 tigers, but the big cats pay little attention to map boundaries, something to which Jehan and Katie Bhujwala can attest. Over glasses of nimbu pani (a refreshing mix of lime juice, water and sugar) on the veranda the Parsi-British couple, who own and run Shergarh Tented Camp, told me about an incident a few years previously. A five-year-old male tiger had strayed from the park and took up residence in the paddy fields surrounding Shergarh, which is located around three kilometres outside Kanha. He left again peacefully shortly afterwards, though not before – after over-coming their initial surprise – the camp’s guests got some wonderful photos, as well as an enviable tale to tell friends back home. Sadly the tiger did not make a return visit during my stay at the camp, but there were plenty of langur monkeys, kingfishers and multicoloured butterflies for me to focus on instead. The wildlife is a testament to Shergarh’s environmentally- and socially-responsible approach, which involves everything from minimising the use of plastic to providing employment opportunities for local people. 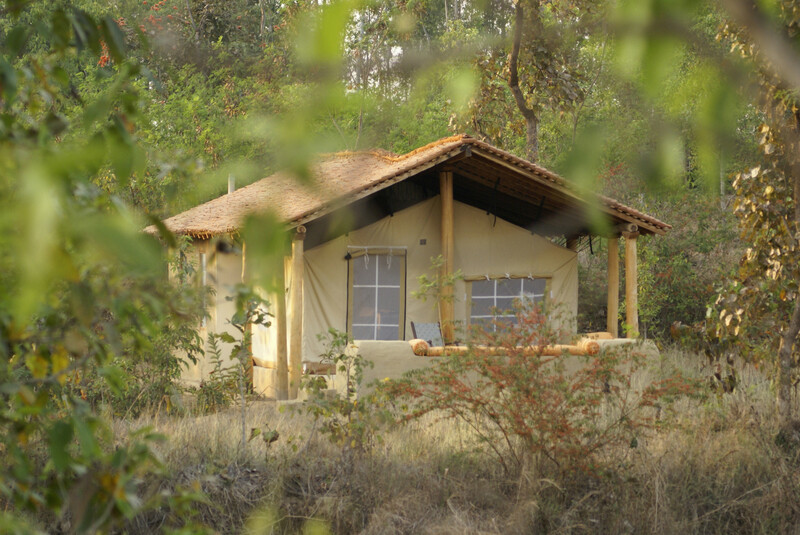 Set up ten years ago, and this year named by The Rough Guide to India as one of the five best places to stay in the country, the idyllic camp offers the perfect blend of luxury and adventure. Shergarh has just six tents scattered throughout 20 acres of woodlands, a low-density that gives each guest the illusion that they have the area entirely to themselves. The impeccably-designed tents themselves are fit for a maharaja: each one has electricity, a king-sized bed, a huge attached stone bathroom, local artworks, evocative wildlife photos, and a private veranda on which to drink your morning chai. 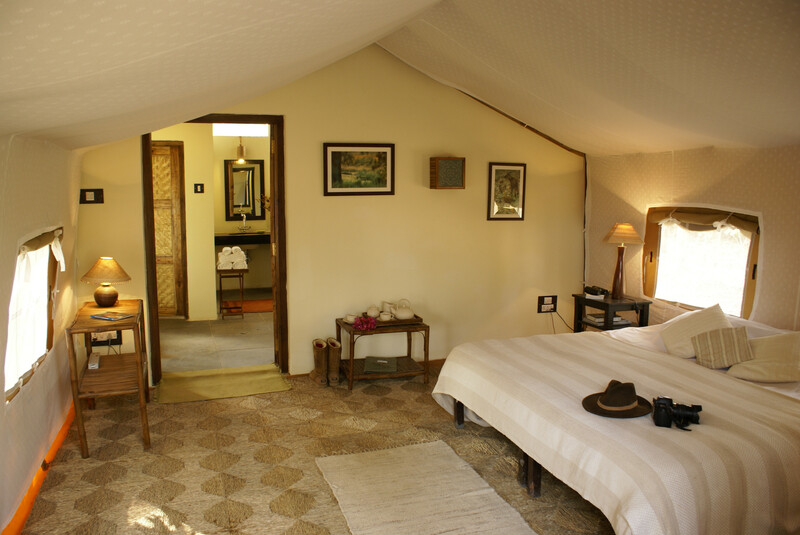 Outstanding, personalised service and innumerable small, thoughtful touches – such as the blankets and hot-water bottles that are provided to keep you warm during the chilly early-morning safaris – elevate Shergarh well above the average luxury safari lodge. The food too is excellent too, and makes full use of produce grown in the camp’s organic gardens. The twice-daily safaris (or “game drives” as they are known locally) in the park are the big draw for most guests – and Shergarh has some of the region’s best guides – but there is also a range of other activities to keep guests occupied. One morning I went on a guided walk through the “buffer zone” – a band of wildlife-rich forest that separates the park boundaries from nearby inhabited areas – watching clouds of dragon- and damselflies, marvelling at spider-webs large enough to trap a small child, and climbing on top of giant boulders for sweeping views across to the Banjar River. Later that day Katie, Jehan and their two young children took me on a cycle ride through the countryside surrounding the camp. We passed pretty villages of mud homes, members of the local Gond community herding cattle and baling hay, crowds of schoolchildren in immaculately clean uniforms, and even a formidable gaur (a type of bison) and her calf. The camp’s wonderfully serene atmosphere is also an attraction in its own right. Indeed there are few better ways to spend a lazy afternoon than by taking a seat under the shade of Shergarh’s tall mango tree, with a slice of homemade cake, a good book, and a soundtrack of birdsong. A version of this article first appeared in the South China Morning Post. In 528BC, Prince Siddhartha Gautama, later known as the Buddha, settled under a bodhi tree and – after surviving a night of temptations and threats – found enlightenment. 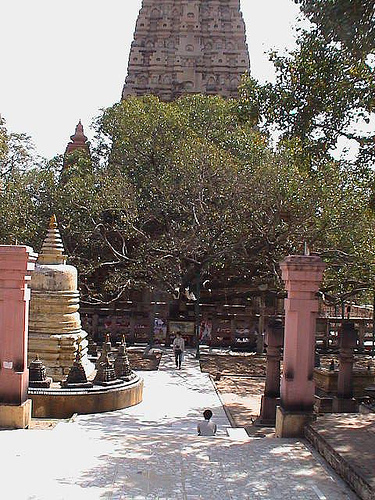 The Mahabodhi Temple, which marks the spot, has since become the world’s more important Buddhist pilgrimage site. Bodhgaya, the town that has sprung up around the temple, manages to retain a wonderfully serene air, despite being located in India’s poorest state, Bihar – an anarchic place, riven with caste conflict. Between November and February, large communities of exiled Tibetans – including, from time to time, the Dalai Lama – join red-robed monks, pilgrims from around the world and curious travellers, giving Bodhgaya a truly cosmopolitan feel. 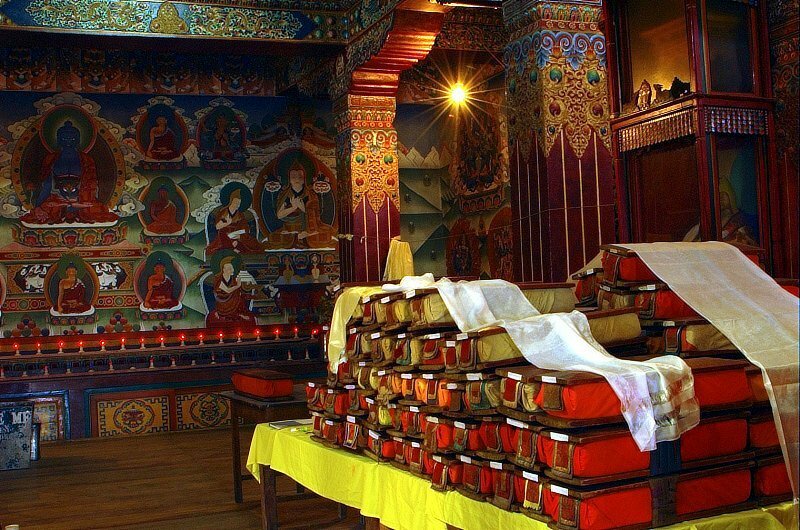 Devotees have built a number of elaborate – and sometimes incongruous – modern temples and monasteries in various national styles: Thai, Japanese, Bhutanese and Tibetan among them. There is also a huge 25-metre-high Buddha statue in an ornamental garden, innumerable meditation centres and increasing numbers of hotels – which run the gamut from austere monastery guesthouses to luxury five stars. The focal point, however, is the Mahabodhi Temple, a sixth-century construction with an elegant single spire surrounded by a collection of smaller stupas and shrines. At the heart of the temple complex is the bodhi tree itself – this one, however, is only a distant offshoot of the original, which was destroyed by Emperor Ashoka before his conversion to Buddhism. Beside the tree, which has multicoloured threads tied to its branches and Tibetan butter lamps around its base, is the vajrasana (thunder seat), a sandstone block on which the Buddha is reputed to have sat. Many people come to meditate here, but regardless of your religious beliefs the place invites quiet contemplation, particularly as the afternoon draws to a close, when the crowds slowly disperse, the sun descends and ritual chants drift over on the breeze. A version of this post was first published in Make the Most of Your Time on Earth.